Situated at the edge of the sprawling Dehradun Valley, the Rajaji National Park is just 8 kms from Haridwar and 21 kms from Rishikesh. The park is spread over an area of 820.42 sq. km. in three Districts- Dehradun, Haridwar & Pauri Garhwal of Uttarakhand State. Previously, there were three sanctuaries situated in the Shivalik ranges - Rajaji sanctuary (estd.1948) Motichur sanctuary (estd.1964) and Chilla sanctuary (estd.1977). In 1983 these sanctuaries consoldiated into a large protected area as 'Rajaji National Park'. The Park is named after the renowned statesman and nationalist leader Sri C. Rajgopalachari (The first and last Governor General of independent India popularly known as 'Rajaji'). Eventhough, Motichur and Rajaji are close to each other, they are separated from Chilla range to the south-east by the Ganges river, Chilla River and agricultural land.About 84% of the national park is forested and the Five vegetation types of forest found in the park are moist Shivalik Sal (Shorea robusta), dry Shivalik Sal, northern dry mixed deciduous and Khair (Acacia catechu), Sissu (Dalbergia sissoo) forest. The park boasts scrub land and grassy pasture lands. The terrain of this park is very rugged and cut up by ravines which are dry in winter. There are chirpines in the upper ridges and sal on the lower hills with Khair and Sissoo in the river beads. The park has a wide variety of fauna with over 23 mammal and 300 bird species. The park has a large number of elephants which together with the rarely seen tiger. Wild boar, leopards, spotted deer, sambar, Nilgai and Ghoral, Langur, Macaque, the Himalayan Yellow throated martern, Civet, Dhole, Kakar, Muntjac, Striped Hyena, Python, Monitor Lizard, Gharial and a few type of deer are commonly seen fauna in the park. The park also boasts of a large variety of avifauna includes peacocks, Jungle Fowls and Kaleej Pheasants, Cuckoos, Black-chinned Babbler, Hornbills, Rusty-cheeked Scimitar Babbler, Woodperckers, , Golden-spectacled Warbler, Oriole, Chestnut-tailed Starling,Bee-eaters, Brown Hawk-Owl, Black-crested Bulbul, Pale-billed Flowerpecker, Orange-bellied Leafbird, Golden-fronted Leafbird, Black-throated Sunbird, Pea fowl, Thrush, Green Magpie, Crimson Sunbird, Minivets and Nuthatches and water birds like Geese, Ducks, Cormorant, Spponbill, teal etc. Parakeets dominated the canopy of the park. The National Park open between 15th November and 15th June every year. The forest department arranges facilities for wild safari inside the park which enables the visitor to have a look at the flora and fauna. 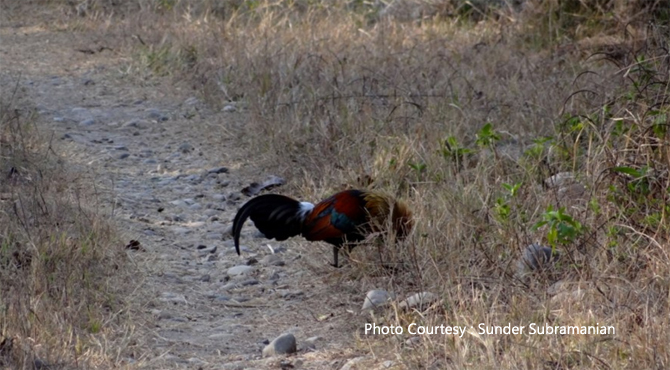 Spotted deer, monkeys, Sambhar can be seen during the Safari. The Safaris can be booked in advance at the forest department reception at Chillawali village. A typical 30km jeep safari last about one hour and is available in the mornings as well as evenings. Fee : Rs.500 to 700. For Safari booking call: Mobile: 09871604712. Entrance Fee: 40/- for Indian and Foreigners 350/-, Parking Fee for Vehicle (Light, Heavy) 100.00/500.00, Still cameras are free for Indians, Movie/Video Camera : 2500/- for Indians and 5000/- for foreigners.